Darwin's Theory Of Evolution — Or Wallace's? Tuesday marks the 150th anniversary of the formal presentation of the theory of evolution. Charles Darwin is credited with developing the theory, but some scholars say Darwin's contemporary, Alfred Russel Wallace, deserves credit, too. Darwin's Theory Of Evolution — Or Wallace's? When the theory of evolution was first publicly presented — exactly 150 years ago today — it wasn't immediately recognized as a revolutionary scientific breakthrough. Rather, the course of its impact was more, well, evolutionary. And even though we generally think the idea of natural selection was devised by Charles Darwin, it turns out that he wasn't the concept's sole originator. 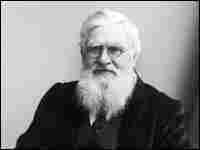 Another Victorian naturalist, Alfred Russel Wallace, came up with the idea after years of living in the Far East, studying and collecting animal and plant specimens. Wallace actually came up with the idea twenty years earlier, says David Quammen, author of the book The Reluctant Mr. Darwin. Wallace delayed publishing anything about his theory because in addition to wanting to amass all the evidence he could in defense of it, Quammen says, "he was a little bit wary of how this drastic radical idea would be received." Wallace was also an outsider, with none of Darwin's wealth or social standing, says Quammen, who is currently writing an article about Wallace for National Geographic. Wallace left school at age 14, and had to support himself by selling insect specimens to museums and collectors. Wallace knew Darwin from a distance, says Quammen, as an eminent and conventional naturalist, who wrote what was, in essence, a best selling travel book, The Voyage of the Beagle. But what Wallace did not know, says Quammen, was that Darwin was working on his theory of natural selection. Darwin told only a very few of his closest friends. When the young Wallace sent Darwin a copy of a paper outlining the theory, Darwin at first went into despair, thinking that Wallace would be the first to claim credit for the idea. Instead, friends of Darwin's organized a presentation of papers by both men at London's Linnean Society. "It was about 30 people in a hot room," says Quammen. "The people who attended the meeting don't seem to have realized what had just been read to them. It just slipped by how important these papers were." Darwin then rushed to publish On the Origin of the Species, which, unlike the Linnean Society evening, did make an impression, one that has been reverberating ever since. It never seemed to bother Wallace that Darwin received all the credit. The two men, says Quammen, became friendly as scientists, though not particularly close personally. He says that Wallace admired Darwin and never felt any bitterness towards him, as far as anyone can tell. He even wrote a book called Darwinism. "That's the extent to which he ceded primary credit to Darwin," says Quammen. "He felt glad to be accepted as a partner, albeit a junior partner, in this great discovery. It seems to be more than he would have hoped for and he was very glad to settle for it."